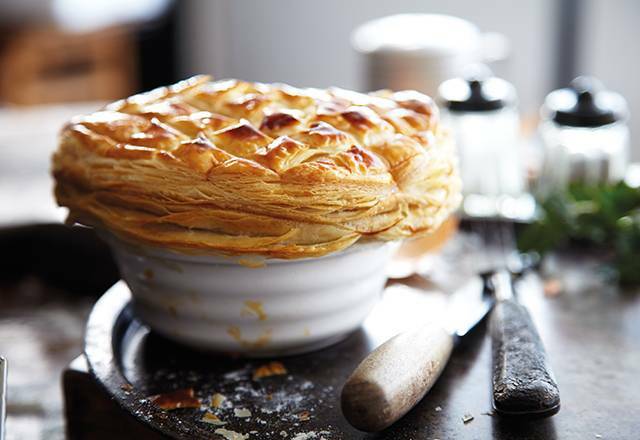 Tender chicken in our creamy ham hock and leek sauce, topped with our light, flaky puff pastry. Preheat your oven to 220°C/200oC fan/ gas mark 7. Remove all packaging, leaving the pies in their ramekins. For best results, brush the pastry with milk or whisked egg*. Place the dishes on a tray in the centre of the oven and bake for 25 to 30 minutes, until the pastry turns golden brown. Make sure your pies are piping hot throughout. Leave to stand for 4 minutes before serving in their dishes. Be careful, they’ll be hot. * Don’t worry, they taste just as good without doing this. It just makes them look even better if you want to impress! Puff pastry (fortified wheat flour (wheat flour, calcium carbonate, iron, niacin, thiamin), water, sustainable palm oil, butter (milk), salt, rapeseed oil), chicken breast (29%), milk, cream (milk), leek (7%), onions, smoked ham hock (4%) (pork, water, salt, preservatives: sodium nitrite and potassium nitrate, antioxidant: sodium ascorbate), smoked bacon (4%) (pork, water, salt, preservatives*: potassium nitrate, sodium nitrate, sodium nitrite, antioxidant sodium ascorbate), white wine, dijon mustard (water, mustard seeds, spirit vinegar, salt), fortified wheat flour (wheat flour, calcium carbonate, iron, niacin, thiamin), butter (milk), lemon juice, rapeseed oil, parsley, chicken stock (chicken, potatoes, water, yeast extract, salt, chicken fat), salt, garlic purée, black pepper. 1. Melt 2 tbsp butter in small frying pan. Add onions and sauté for about 5 mins until they are tender. 3. When the peas are done, drain them, then add the butter and mint. Smooth dry white wines, like chardonnay, would be our tipple of choice here. Either that or a bright, fruity cider.